Engineered for high-production sawyers who prefer a twin rail sawmill design, the LX450 twin rail hydraulic portable sawmill is loaded with many high-performance features including advanced hydraulic log handling, Accuset2 Setworks on an adjustable arm, and board dragback fingers with outfeed table. 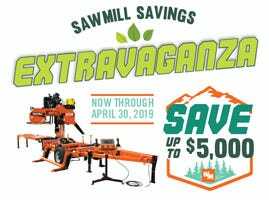 With many of the proven features of the Wood-Mizer LT50 hydraulic portable sawmill, a key innovation of the LX450 sawmill is its rigid LX Frame that holds the control panel, engine, and sawhead in a stable structure. 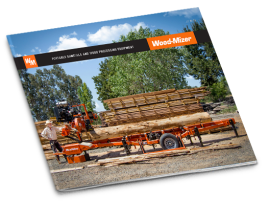 Wood-Mizer's LX series mills are the only sawmills in the industry to feature two parallel hardened steel rods that provide a smooth and stable base for the sawhead to travel on. The LX450 hydraulic is completely portable and ready for road travel with a standard single axle trailer and electric brakes. Six fine-adjust outriggers and bubble levels on the head and mast assist with set-up and leveling of the bed prior to sawing. Logs are loaded and turned hydraulically with loading arms and a heavy-duty bi-directional chain log turner for maximum log control. Logs are secured onto the bed by four side supports (two hydraulically controlled vertical supports for fast positioning) and a heavy-duty hydraulic log clamp. Two hydraulic roller toeboards assist with precise leveling of the log on the bed for tapered logs. Accuset2 Setworks and powered head controls position the saw head height to prepare for sawing. Accuset2 calculates board thickness to quickly and accurately reposition the sawing head automatically for the next cut. Once the blade is engaged with an auto clutch toggle switch, the saw head advances through the log with the power feed control that includes variable speed for optimal sawing control. Once the cut is completed, the saw head is raised and reversed by the powered saw head controls and positioned for the next cut. A water tank feeds lubrication directly to the blade to improve cutting performance and keep the blade clean. Material dragback fingers and a 2' x 2' outfeed table assists with offbearing boards. An optional debarker helps extend blade life between sharpenings by clearing a ¼” wide path in front of the sawmill blade’s cut entry. The adjustable blade guide arm keeps the blade well supported while cutting various sized material. Blade tension is easily adjusted, and keeps the blade at the proper tension for cutting. The LX450 twin rail hydraulic portable sawmill comes fully assembled with one Wood-Mizer sawmill blade. Free one-on-one sawmill training by an experienced service representative is included during your Wood-Mizer location pick up or home delivery. With a 30-day money back guarantee, 2-year sawmill warranty, and 5-year chassis warranty, the LX450 hydraulic is backed by the same level of service, quality and safety features shared by the entire family of Wood-Mizer wood processing equipment.